Home » Cartograms » The Housing Value of Every County in the U.S.
After the last post, which looked at housing values across New York City, I thought it would be interesting to take a more granular look at housing values across the U.S.
To create the map below, I took the total residential property value for every county in the U.S. (the contiguous 48 states), and substituted those values for each county’s land area. Aside from the Northeast, Property value in the U.S. is concentrated in a relatively small number of areas. In the animation below, notice what a small portion of the U.S. land area is actually covered by the red counties. Update: The total residential property values shown here are a function of many factors: population density, home size, price per square foot. For a similar map that looks just at the value of housing, see: Mapping America’s Hottest Housing Markets. Here is the previous post on New York City property values, which explains how the values were calculated (on a related topic, here is why the rent is so high in NYC). All other county-level property values are from this post on The Economist. This type of map, in which each area is substituted by some other mapping variable, is called a cartogram. They are not used all that often because there can be a fair amount of manual work involved in making the areas accurately sized while maintaining the basic shape. For this map, most of the work was done using Carto3F (documentation). Scapetoad is another great tool for making cartograms. It is not as customizable, but it is much more user-friendly. In my opinion, nobody does data visualization better than the New York Times. But on this one, I agree. The maps give you a sense of where the vote would have flipped, but hard to know what that means without a sense of the relative importance of the locations. Really like this graphic, and as an avid NYT reader, I hope they figure out that their county maps could be much better for looking at NYC (come on it’s the NEW YORK Times!). Sorry to nitpick — but I am a Hawai`i resident. I noticed you have the parenthetical noting it’s the contiguous states, but this doesn’t match the title of the post for all US counties. Was this choice because of lack of data for counties outside the 48, or because Cartogram doesn’t work so well with floating (non-contiguous) polygons? You are completely right to call me out. Omitting Hawaii was a lapse on my part, and it should have been included. The fact that Hawaii is floating did cause a few complications, but really the problem was with Alaska. 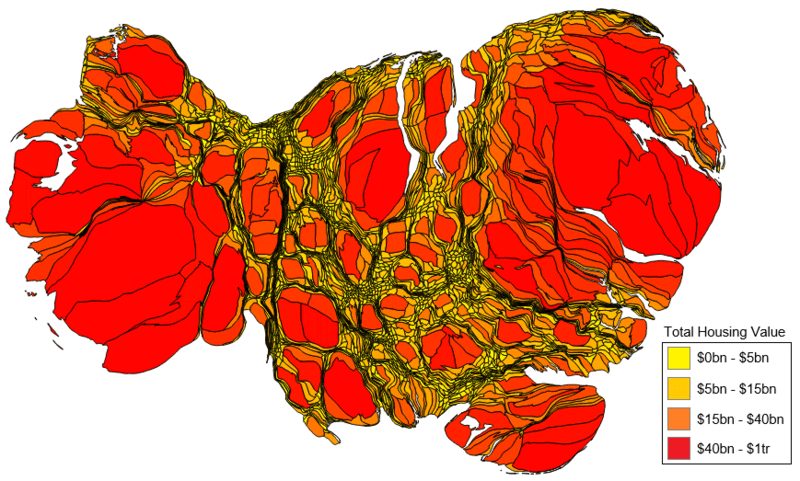 Because of its size, it was causing some weird problems when creating the cartogram. And I thought the cleanest thing would be to go with just the contiguous 48. Though I really should have left Hawaii alone. Housing values are high there, and seeing it by county would have made for an interesting part of the story. Can you put the county names on the bigger ones where it will fit? Can you put the state boundaries on the states with the state abbreviation in the state? Can one double click or something to get a full screen version of the map to see details better? It would be nice to see a NON .gif version of this map so one could actually LOOK at the counties instead of an amorphous blob. Also a clear date on an article is always a good thing. Can you publish a similar map showing voter turnout and/or political affiliation? This particular map, as well as the one showing GDP by county in the U.S. serves as fairly good proxy as opposed to the strictly geographical area maps I’m seeing showing way too much red as opposed to the population in general.